Gregory Peck is one of the greatest film stars in cinema history. With a large onscreen presence, he was best suited for heroic character types as a good, honorable man. He is best known for his Academy Award winning portrayal of lawyer Atticus Finch in the 1962 film "To Kill a Mocking Bird." A native Californian, Gregory Peck first got the acting bug when he was spotted by the theater coach at UC Berkeley. Peck was exempt from Military Service in WWII due to a back injury. His first film was Days of Glory (1944) and his career remained strong through the 1960s and he made addition appearance through his golden years. 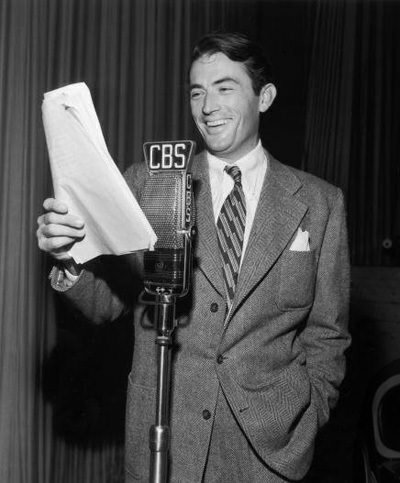 The OTRCAT Gregory Peck collection includes all known appearances of Peck in the radio airwaves. Notably included in this collection are his reprised roles in "The Yearling," "Now Voyager," and "Gentlemen's Agreement" on Lux Radio Theater. He also appeared in Suspence, Screen Guild Theater, Theater of Romance, Screen Director's Playhouse, and many more. Be the first to comment on "Gregory Peck"